Matzerath’s mother rarely shared her thoughts with anyone. She is as elusive now as when he was a small boy being raised within the shadow of the religious buildings where she still works as a cook. Bishops and abbots come and go, and red-robed Princes of the Church make their visits, for which she must dress appropriately – but she remains. At least Matzerath assumes she is still there, though he has not been back for five years. Matzerath is small in stature and taken to be younger than he is. At thirteen he is treated as seven. He allows this because he finds there are more advantages then penalties. He knows far more than is expected of him, and avoids many pitfalls through the guile no one expects he has. He also achieves more than is expected from him, and is given much leeway for a child. Had his real age been obvious, he would be perceived as dim-witted. Because he is thought of as a child, he is considered gifted. Matzerath’s mother is aware of how her son is tolerated – she even encourages his guile. He is treated better than most children, whose father is absent months at a time sailing the North Sea. Matzerath is also getting an education of sorts, which is generally restricted to the children of nobles and the wealthy. He has learned how to read and write, along with the rudiments of mathematics and geography. He also pokes his nose into the stables, and the smithy, and the carpenters, picking up their basic skills. He follows his own mother with interest, and can chose, prepare and present many of the dishes she serves at the Monastery. For the notables at the cathedral, and other clergy, she is expected to produce more sophisticated fare. Matzerath has even acquired some of these skills, but a puny child is forbidden to appear near the high table. He does get to nibble the leavings but notes – as he also does at the Monastery – that very little is ever left. Matzerath would have been content to stay in this arduous life seasoned with episodes of interest and learning, but his elusive nature is discovered by a visiting bishop. The Bishop is a militant with evangelical frenzy. He is intent upon forming a Children’s Crusade to march to the Holy Land. Matzerath is not sure what this means, though he gathers it will offer an opportunity to leave the confines of the town and local villages where he has spent his life. His mother is better informed. 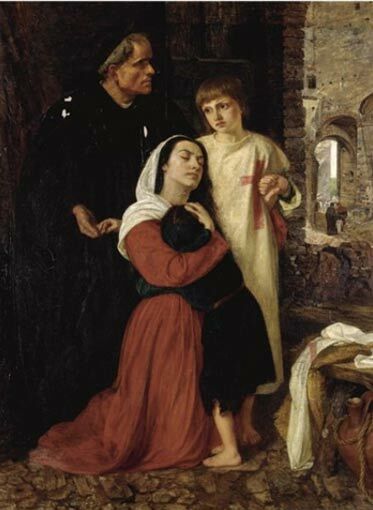 Even though the last Children’s Crusade happened generations ago, and the Church proclaims it was a wondrous act for the Glory of God, she is fully aware that most of the children never came back. And that the Holy Land is still lost to the grip of heathens. The murmurs from the Monastery and the high table reveal this bishop to be a renegade and unsound in judgment. His ‘new’ crusade is predicted to be a disaster. His abilities to lead it are a joke. However, he does have the ear of the Pope, and his family has much wealth to give to the Church. Matzerath does not possess an abundant affection for his mother – not for anyone – but he realizes that regardless of the amount of work she extracts from him, she generally does what is best for him. He pays attention to her instructions and her observations and her warnings. She also encourages him to tell her what he sees and hears. As he becomes older, she also wants to know what he thinks about the things he sees. Matzerath realizes she is using him as a spy, but he does not mind. He knows his mother sometimes manipulates the information he brings for her own well-being, but these rewards also come to him. Matzerath heeds the warnings his mother gives about some of the priests and monks and their interest in boys. He discovers this himself upon a couple of occasions, and even satisfies one priest just to see what it is like. He shares this with his mother because he knows she sometimes does the same.